Social Pulse is a social media analytics tool to help HR professionals understand employee voice based on enterprise social media. It combines topic extraction and sentiment analysis of unstructured text with structured demographic information from human resources information systems to provide insights into different break-downs of the workforce population using different visualizations. Social Pulse technology has been piloted with 100+ users and productized to help create insights into unstructured survey data (called Survey Analytics). 1×5 is an internal crowdfunding system to foster grass-roots innovation and collaboration within an organisation. Through multiple deployments to 1000+ users during 4 different trials, we studied motivations, values, and cross-geography / organizational collaboration. The system has been adopted by the IBM CIO and is being used frequently to foster technology innovation within the IT department. This project is revisting calendars and time management. IBM Timeflash is a novel site that let’s users share, discover, and connect around events with professionals. We call Timeflash a microcalendar because the notion of microblogging was our model for the user interaction in Timeflash. Users can add new events to their event stream within a single textbox. We parse event data from text and post a structured event to the event stream of the user. Events can be discovered through subscriptions to other users, and users can copy / add events from other users to their own time stream. The project name Muse is an umbrella name for a number of projects in the social recommender space. 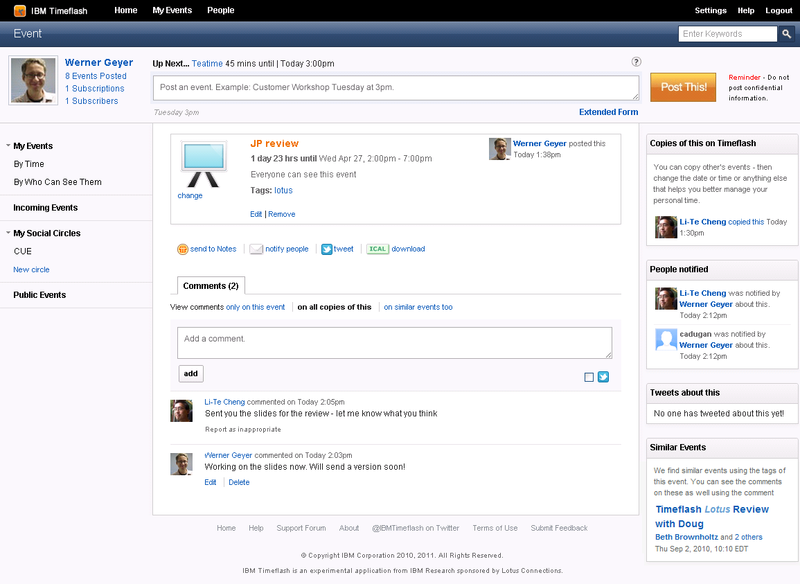 The goal is to inspire users of social media sites to contribute content. For example, I worked on a recommender system that helps people to fill out their online profiles by suggesting topics / questions to answer. 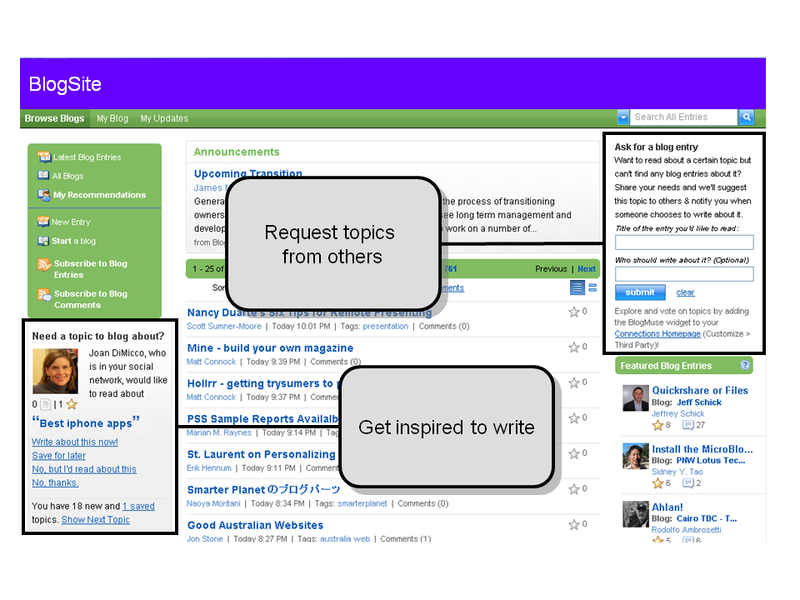 Another system – called Blog Muse – allows users to request a blog topics they would like to read about. The system then routes these user-requested topics to other users who are likely to write about them, closing the loop between blog readers and writers. These targeted request help creating content that matters in an enterprise context. This work was done on beehive and on the IBM Connections product platform. 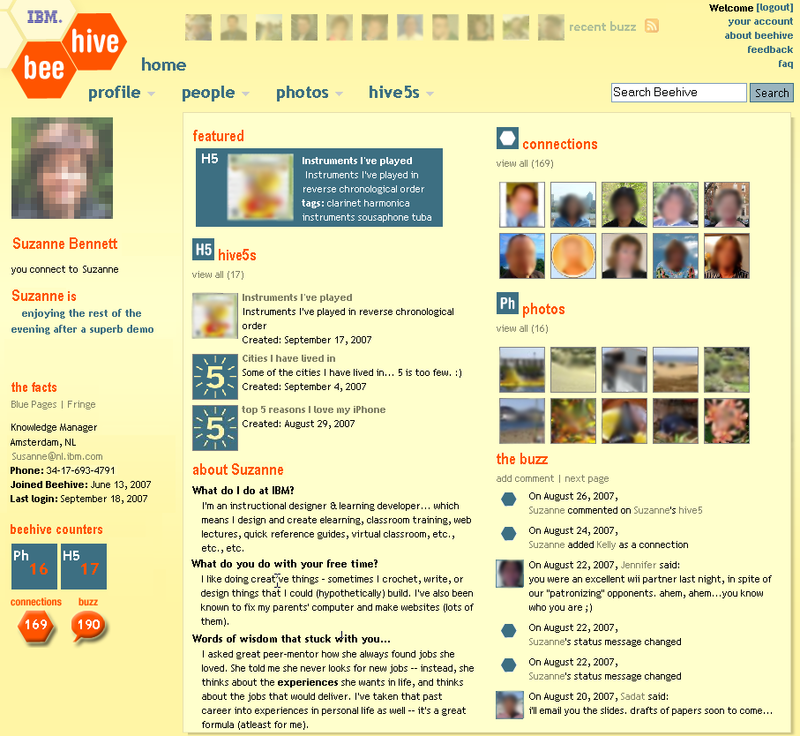 Beehive is an internal social networking site that gives IBMers a “rich connection to the people they work with” on both a personal and a professional level. Beehive helps employees make new connections, track current friends and coworkers, and renew contacts with people they have worked with in the past. We created the site to help IBM employees meet the challenge of building the relationships vital to working in large, distributed enterprises today. Beehive has more than 65,000 users and is our internal playground to understand and measure the value of social software for an enterprise. Malibu is a personal productivity assistant that provides peripheral access to and awareness of activities, tasks, social-bookmarks, and feeds to assist knowledge workers in their activity-centric work. This project was logical continuation of my work on Activity Explorer. In the context of Malibu I also started some explorative machine-learning projects on automatically prioritizing activities, sensing a users activity and recommending related resources based on a user’s context. 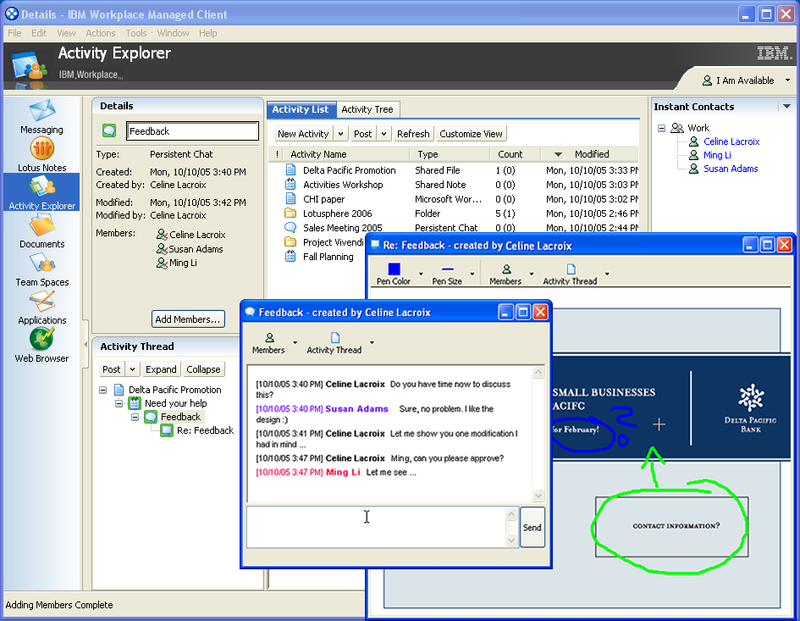 Activity Explorer is a novel hybrid productivity application that combines informal, ad hoc communication with formal, more structured collaboration tools. The two key ingredients of Activity Explorer are Live Shared Objects and Activities. Live shared objects provide a seamless user experience between synchronous and asynchronous collaboration. The basic idea behind Activities and Activity-Centric Collaboration is simple: Reorganize collaboration to reflect the work being done, rather than the technologies that support the work. An activity can be considered a logical unit of work that incorporates all the tools and resources to get the job done. Representing an activity explicitly aids knowledge workers in capturing and rapidly switching work contexts. I had been working on AE for more than three years as inventor and architect. AE went rapidly through several iterations from research prototype to product including several formal evaluations. AE has provided the foundation and seed for IBM’s Activity content type in IBM Connections. 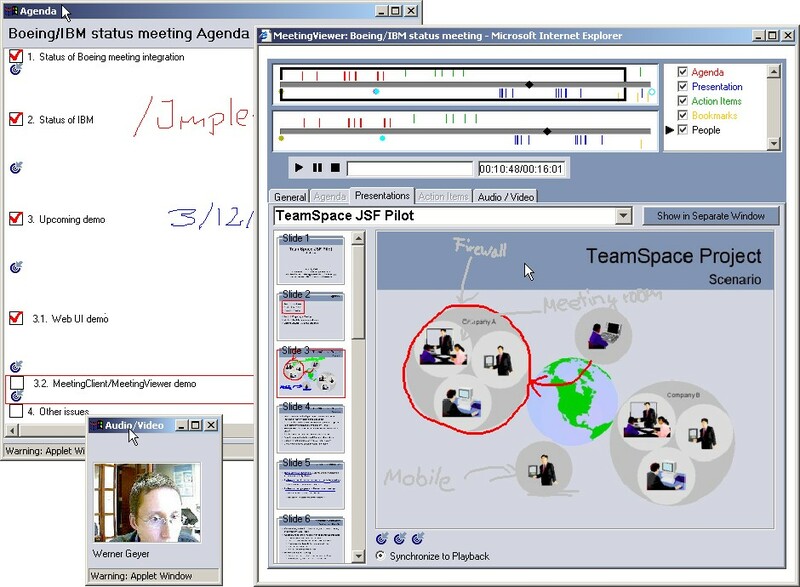 As a post-doc at IBM T.J. Watson Research in Hawthorne, NY, I worked closely with a team at Boeing Mathematics and Computing Technology and Georgia Institute of Technology, on a system called TeamSpace, which captures and provides access to virtual meetings. Unlike VCR-like recordings of meetings, this system provides a fully indexed record of a meeting. 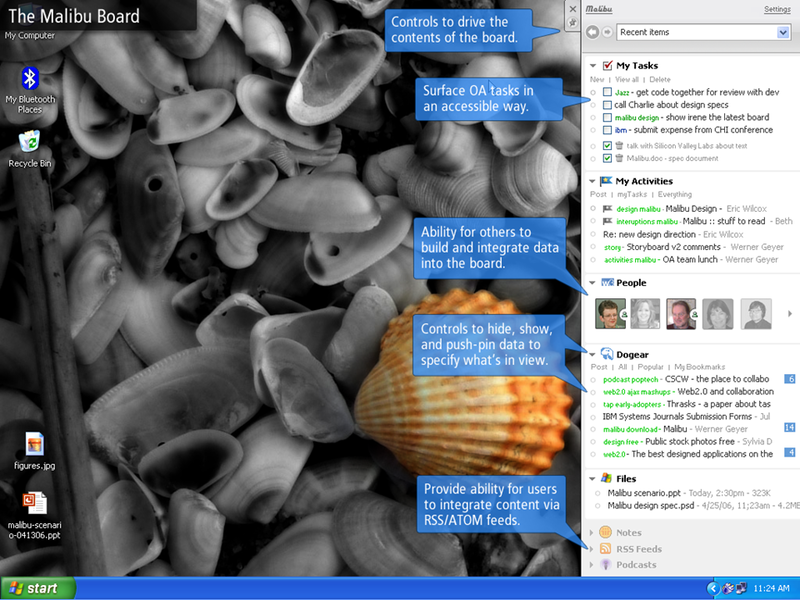 The record is a visualized timeline of the meeting based on user interactions with objects such as agendas, action items, presentations, and bookmarks. 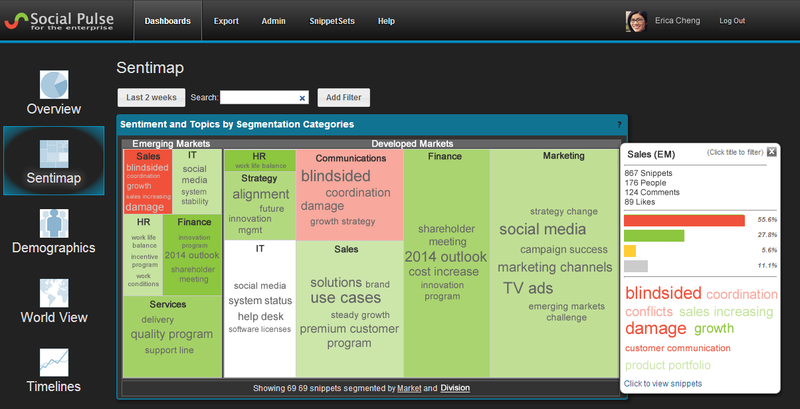 The system helps relate knowledge from past meetings to current team activities. For example, a team member can create an action item, create a meeting to work on the action item with the group, and then save the action item at the end of the meeting, making the item available for other meetings.